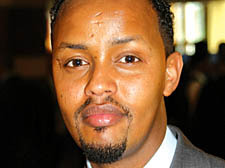 For Ibrahim Isse, project co-ordinator of the Somali Youth Development Resource Centre (SYDRC) the shootings of two Somali teenagers could not be allowed to overshadow the largest-ever gathering of community leaders at the Pan London Somali Youth Conference in Holborn on Tuesday, which he had spent months organising. The Camden-based SYDRC is behind some of the most positive efforts at integration taking place in London, as the presence of Camden’s council leader Keith Moffitt at the conference showed, Mr Isse said. But an underlying tension is shown by the fact that only last week 14 members of a largely Somali gang, the TMS, were the subject of Asbo action by the council and police who accuse them of drunkeness and drug-dealing in Camden Town. For many conference members, the issue is one of generational break-down. “There was a trigger waiting to be pulled,” said Mohamed A Abdullahi, chairman of the UK Somali Community Initiative.